and larger, tastier harvests. Not a fertilizer or hormone, all-natural Spray-N-Grow® is a unique, organic-based micronutrient complex. It's like vitamins for your plants. This combination of essential nutrients work on vegetables, fruits, flowers, herbs, as well as shrubs, trees, houseplants, and even orchids. 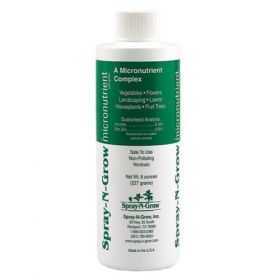 Spray-N-Grow® is completely safe, economical and easy to use. Just spray the leaves of plants and let dry. Sit back and collect the compliments.